Dimenhydrinate Overdose is the accidental or intentional intake of the drug in dosage higher than prescribed values. Dimenhydrinate is used as an anti-histamine and anticholinergic drug, meaning it is used to treat allergies and calm the nervous system respectively. In general, the medicine is used to treat nausea, pain, vomiting, reduce nervousness, motion sickness, etc. What are the Causes of Dimenhydrinate Overdose? What are the Signs and Symptoms of Dimenhydrinate Overdose? The signs and symptoms of Dimenhydrinate Overdose can vary from one individual to another. It may be mild in some and severe in others. Several systems of the body, such as the nervous system, vascular system, urinary system, and ENT may be affected. How is First Aid administered for Dimenhydrinate Overdose? Who should administer First Aid for Dimenhydrinate Overdose? 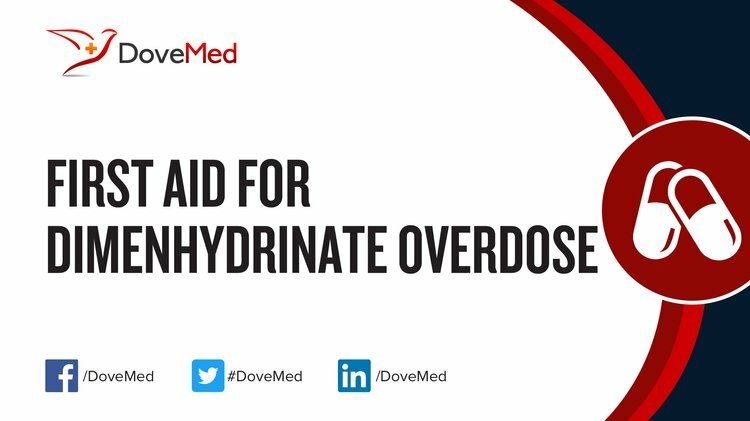 First aid for Dimenhydrinate Overdose is administered by healthcare professionals. What is the Prognosis of Dimenhydrinate Overdose? How can Dimenhydrinate Overdose be Prevented? Enarson, P., Gouin, S., & Goldman, R. D. (2011). Dimenhydrinate use for children with vomiting. Canadian Family Physician, 57(4), 431-432. Bernhard, M. K. (2013). Dimenhydrinate overdose. Reactions, 1477, 16-9. White, R. F. (2015). Dimenhydrinate abuse/overdose. Reactions, 1569, 98-19. Palaniswamy, C., Selvaraj, D. R., Chugh, T., Singh, T., Khalique, O., Tsai, F., & Sandhu, R. (2010). Brugada electrocardiographic pattern induced by amitriptyline overdose. American journal of therapeutics, 17(5), 529-532. White, R. F., Honer, W. G., Procyshyn, R. M., & Vila-Rodriguez, F. (2015). Dimenhydrinate Use Disorder With Chronic Psychosis. Journal of clinical psychopharmacology, 35(1), 105-107. Khoja, S. S., Chauhan, P. H., Patel, M. N., & Jani, H. D. (2016). A Review on chemistry and pharmacological activity of Cinnarizine and Dimenhydrinate combine dosage form. PharmaTutor, 4(10), 26-30. Rambod, M., Elhanafi, S., & Mukherjee, D. (2015). Brugada phenocopy in concomitant ethanol and heroin overdose. Annals of noninvasive electrocardiology, 20(1), 87-90. Sawicka, K. M., Goez, H., & Huntsman, R. J. (2016). Successful treatment of paroxysmal movement disorders of infancy with dimenhydrinate and diphenhydramine. Pediatric neurology, 56, 72-75. Waters, R. (2014). Over-the-counter Medications (Vol. 11). Simon and Schuster.